What to do if a baby gets a sunburn? 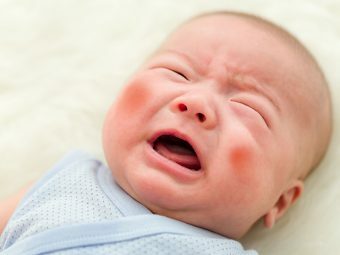 How to prevent sunburns in babies? A walk by the pond, a trip to the pool or a picnic by the beach. When the day is bright and sunny, there are several options to have a day out with your baby. But sunny days also bring the risk of sunburns, which can be more than just darkening of the skin in babies. MomJunction tells you about the dangers of sunburn in babies, how to protect them from harsh sunlight and prevent sunburns when you are out on a sunny day. A sunburn is a damage to the skin due to excessive exposure to ultraviolet (UV) rays of the sun (1). Usually, the skin produces a pigment called melanin to protect itself against the harmful effects of the invisible UV rays. But if the intensity of the UV light exceeds the ability of the melanin to protect the skin, then a sunburn occurs. Since the damage to the skin is similar to that of an actual burn, the condition is called sunburn. How Does A Baby Get Sunburn? Not wearing sunscreen is the most common cause that makes babies susceptible to sunburn. 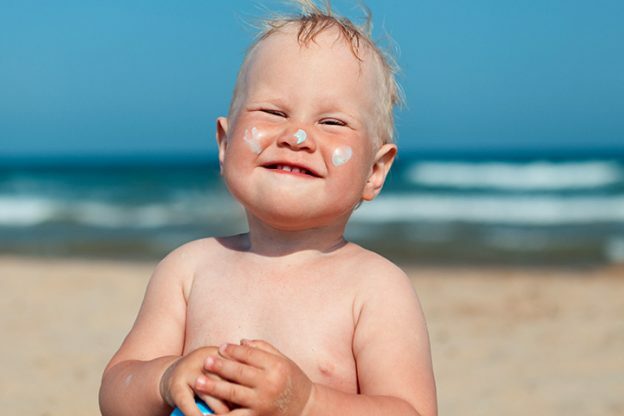 Even spending a few minutes under the sun without sunscreen can cause sunburns in infants. Lack of a physical barrier like a hat or an umbrella against the sun exposes the baby to the UV rays, causing sunburns. Spending too much time outdoors during the day, especially between 10am and 4pm, when the sun rays are at their strongest is indeed a bad idea. The rays are harsher in summer and must be avoided. Being light-skinned can mean more chances of sunburn. Babies with a light skin tone have less melanin. Direct sun exposure for just 15 minutes can give them a sunburn. Those with darker skin can usually tolerate the sun for an hour but can still get sunburnt. Skin conditions such as lupus, an autoimmune disease, can make the baby’s skin sensitive to sun rays, thus accelerating the development of sunburns. Some medicines, such as the antibiotic doxycycline, make the skin vulnerable to sunburns as a side effect. Yes. Even an infant’s eyes are susceptible to sunburn. The sunburn of the eyes is called photokeratitis. It causes redness, irritation, and inflammation in the eyeball. In extreme cases, it can create blurry vision too (5). Not wearing protective sunglasses with UV protection can result in photokeratitis. Redness of the skin: The sunburnt skin would be red to dark pink. Infants with darker skin tone will show a pinkish tinge when sunburnt. You may even observe the outline of the sunburn if the clothes partially protect the body. Sunburnt skin is tender, and older toddlers may even point towards their sunburn, indicating pain or discomfort. Warm skin: Sunburnt skin feels warm when touched, even after you move your baby to a cooler place. Redness, inflammation, and soreness in the eyes: The eyes become red, watery, and may feel sore when sunburnt. The baby may also blink frequently due to the irritation. Usually, a sunburn does not cause anything beyond redness and tenderness of the skin. But in some cases, there can be extensive damage to the skin, and you will have to take the baby to the doctor. Extensive sunburns can even cause dehydration and heat stroke. If the baby shows any of the symptoms mentioned above, take them to a doctor. Symptoms of sunburn are at their worst 24 hours after sun exposure and usually go away within five to seven days, with proper home care. Give the baby a cool water bath. Cool water baths can soothe the baby’s sunburnt skin. The water should be plain and cool but not ice-cold! Avoid adding oatmeal or baking soda since you may not know how the baby’s skin would react to it. Pat-dry the affected area after the bath. Apply cool water compress. Soak a towel in cool water and put it on the affected area for several minutes. Do not rub the area with the damp towel; instead gently place it on the sunburnt skin. In the case of sunburnt eyes, you can put a damp cloth on the eyes lightly, without adding any pressure. Use water-based moisturizer: Apply a safe, water-based moisturizer to the skin. You can even use an aloe-based skin gel. These skin applications help soothe the pain and burning sensation while also rehydrating the burnt skin. Keep the surroundings cool and well-ventilated. Ensure that the baby’s room is pleasant, with a cool breeze and adequate ventilation. Dress the baby in loose clothes. Loose clothing reduces the chafing of sunburnt skin, preventing blisters from bursting. Natural fibers like cotton are good since they allow the skin to breathe. Use loose bandages for blisters. If the baby develops blisters, cover them with loose gauze bandages that facilitate ventilation and prevent the baby from picking at the blisters. Blisters subside without bursting once the sunburn heals. If a blister bursts naturally, then wipe it clean with cotton dipped in antibiotic liquid and dress with a gauze bandage. Give them plenty of fluids. Give the little one plenty of fluids to reduce the sensation of heat on the sunburnt skin. If the baby is younger than six months old, then increase the number of feeds. Infants older than six months can be given frequent sips of water in addition to breast milk. Consider appropriate medication. Medicines like acetaminophen and ibuprofen reduce pain while a cortisone cream alleviates inflammation. Consult the baby’s pediatrician to learn about the medicines you can use for sunburns. 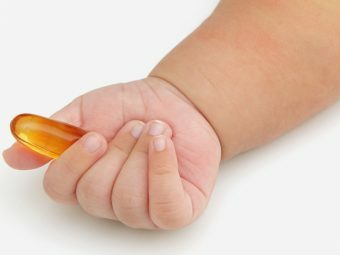 Pediatricians usually recommend topical antibiotics to prevent infection due to the ruptured blisters. The doctor may also suggest anesthetic eye drops to alleviate pain in the case of sunburnt eyes. Apply first-aid creams: They may contain compounds like benzocaine or lidocaine that can irritate the skin and even cause a skin allergy. Do not use these on your baby’s sunburnt skin. Use medications without doctor consultation: Do not give any medicine to relieve pain without consulting the doctor. Some medicines that work well for adults may have harmful side-effects in children and babies. Apply petroleum jelly: Petroleum-based and oil-based creams block the skin pores, preventing heat and sweat from escaping. It can prevent the sunburnt skin from cooling down and also prevent blisters from drying. Stick to water-based moisturizers and gels. Pop the blisters: Never pop blisters no matter how ballooned they seem. Bursting a blister is not going to make the skin heal faster. If the blisters rupture, then wipe them clean with cotton dipped in antibiotic liquid and dress with a gauze bandage. You can also use a topical antibiotic to prevent infection. Peel the dry, sunburnt skin: As the skin heals, you may notice that its top layer starts to flake and peel out. Let the dead skin shed naturally, avoid peeling it off forcefully. When blisters burst naturally, they also leave a dead layer of skin, which falls off on its own. Further sun exposure: Sunburn is not going to get better if you expose the skin to sunlight again. So avoid taking the baby out in direct sunlight until the skin heals. Minimize sun exposure. Pediatric experts state that infants below the age of six months should not be exposed to direct sunlight (9). If you have to take your baby out during the afternoon, then make sure you keep in the shade. An umbrella works well, but a canopy offers better protection. Do keep in mind that on a hot summer afternoon, an umbrella may provide only 50% protection from UV rays. Staying indoors during the daytime is ideal. Use sunscreen: Choose a broad spectrum infant sunscreen that protects against UVA and UVB rays. Select one with a sun protection factor (SPF) of 15 to 30. Apply sunscreen about 15 minutes before going out in the sun and use a waterproof sunscreen if you are planning to take the baby to the beach or the swimming pool. Do note that sunscreens should not be applied to babies below the age of six months (10). Physical barriers and avoiding sun are the best options for them. Dress the infant in long-sleeved cotton clothes: Long-sleeved cotton clothing helps protect the skin. Give preference to white-colored clothing since it can reflect the sunlight away from the body. Natural fibers like cotton also assist in ventilation. Use sunglasses and hat: Use a wide-brimmed hat that snugly fits your baby’s head and sunglasses with UV protection. The hat protects a wide area around the head while sunglasses protect the eyes and the delicate skin around them. 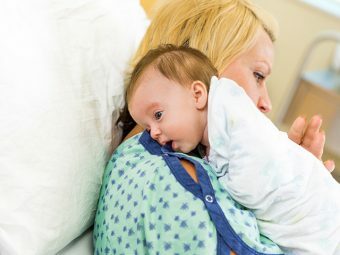 Sunburns can make your baby feel miserable, but it is also a condition that you can prevent with precautions. Remember to dress your infants appropriately before going out in the sun and if exposed to the rays for longer than a few minutes, check for signs of sunburn. Infants as they cannot express their pain associated with sunburn, so you need to take every care to minimize the effect. Do you have any tips to protect babies from sunburns? Share your ideas and experiences in the comments section below. 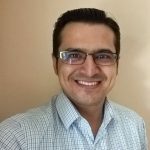 How To Take Care Of Your Newborn Baby In Winter?